The Intrexx search system is modular in a multi-tiered manner to guarantee the greatest level of flexibility. Intrexx uses an external search engine for searching and indexing. The adapter for Apache Solr is provided with the delivered package and is installed when using the standard configuration. The Solr Adapter supports the Intrexx Portal Server, external individual instances and the SolrCloud installation. The Apache Solr server runs as an individual process. If a single process is not enough, Apache Solr can also be run as a Cloud installation. Indexing FileWalker directories uses the Solr server, the portal server is not involved here. Apache Solr can be configured in many ways. Intrexx defines logical default settings when setting up the server but does not overwrite modifications so that almost no limits are set for implementing your individual requirements. Search results can be processed as needed using view pages in addition to button configurations. The user can choose between using the settings determined by the administrator or to use his own. Here as well, the user can choose between using the settings determined by the administrator or to use his own. The search result can be filtered according to the users' requirements by using the desired applications or facets. Facets (e.g. "Industries") can be defined by the administrator and assigned to individual data fields. When searching, the user is shown the facets that can be used for the context and can then filter the information precisely (e.g. Industry = "IT industry"). To support the user in this, the available values are presented as buttons. The search module is multilingual. The application's developer can determine the languages that the data is indexed and searched through in. The different language indexes can contain various fields. Users select which language they'd like to search in. Depending on the language chose, different search result lists will be displayed. When entering search terms, suggestions that relate to what's been entered will be shown. With Intrexx's default settings, this list contains terms from the data being searched through. Dictionary sources, e.g. specialist terms databases, are also available. These can be integrated by making a corresponding modification to the Solr configuration. With this settings, suggestions will be shown when users begin entering search terms. Please note that the setting "Show search suggestions" also needs to be activated for the additional control Search in the Design module for this to work for the portal-wide search. If a search term is sent with potentially incorrect spelling, an option will be displayed on the answer page as well as the found results. This option offers the user to select the correct term and then to search by this term. Alternatively, the system can automatically search for the correct term straight away, based on a rule. The search can anonymously keep track of the search terms in a file. In the Portal Manager, an area is available with a selection of interpretation options, e.g. most popular search terms and trending searches. The protocol file contains JSON data so that individual, browser-based interpretations can be implemented easily. Database content and files connected to it can be search through together. For example, by entering the search term "Book Edgar Allan Poe", it is possible to find article data records with the type "Book" that have attachments that contain "Edgar Allan Poe". Database content can be searched through using various interconnected data records (Parent/Child relationships or references). 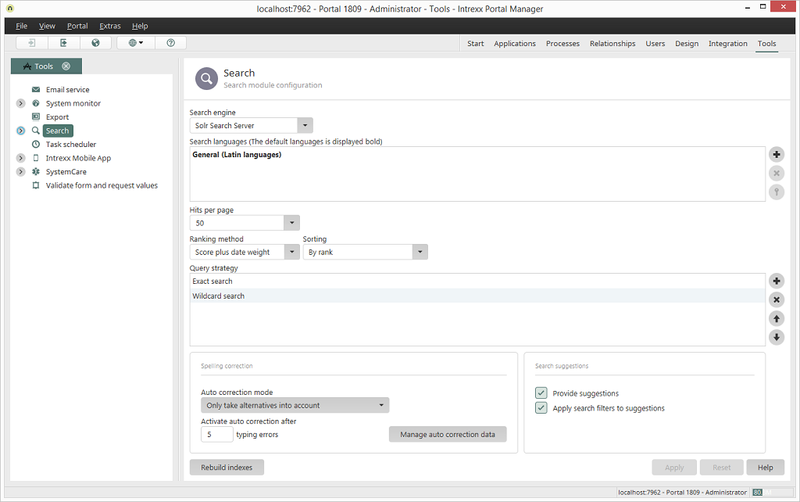 Search configurations have their own permissions meaning that tailor-made searches can be implemented for each user group. Intrexx Share is also searched through in the global search. By clicking on a hit, you can jump to the parent data set. The search result display now controls forward paging, the results list is no longer limited to a specified length.